The April 2014 SoxProspects.com Player and Pitcher of the Month honorees Mookie Betts and Rubby De La Rosa staked their claims to the title early and by the end of the month had won by acclimation. 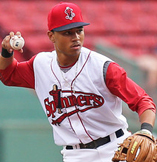 Betts' start to 2014 is likely to become the stuff of legend, at least around SoxProspects.com. His .430/.481/.688 (40 for 93) triple-slash line leads the Eastern League in batting average, on-base percentage, and slugging, and his power has been pretty evenly distributed with four home runs, ten doubles, and a triple. As is always a good sign, he has so far walked more than he has struck out (11 walks vs. eight strikeouts) and has even stolen 10 bases in 13 attempts. He was twice voted SoxProspects.com Player of the Week for the weeks of April 3-6 and 14-20. Since starting the season ranked 10th in the SoxProspects.com rankings Betts has moved up to the third spot - stay tuned to see if he climbs into the top spot when Xander Bogaerts graduates from prospect status on Friday. De La Rosa started the season on a strong four-game run. In his first start, he worked five shutout innings against Lehigh Valley (PHI), allowing only two hits and no bases on balls while striking out five and earning the win. Opposing batters finally got to Rubby in his second start April 10 at Buffalo (TOR) although only to the tune of a single run on two hits and two walks with four strikeouts in a 5 2/3 inning no-decision. Consecutive starts at and at home against Rochester brought a pair of quality starts, six innings pitched at Rochester (MIN) April 17 with one earned run on four hits and a walk with five strikeouts, and at home April 22 featuring six more innings of one-run ball on three hits, one base-on-balls and seven strikeouts, each ending in a no-decision. His only rough start of the season came in his final start of April in a rematch at Lehigh Valley on the 27th, allowing four earned runs on four hits with three walks and five strikeouts over five innings in a losing effort. De La Rosa owns a 1-1 record, with 2.28 ERA, having allowed seven earned runs on 15 hits, holding opposing batters to an .163 average, striking out 25 while walking seven over 27 2/3 innings.